Holiday decorating is no laughing matter. Each year, millions of Americans transform their homes into festive winter wonderlands. We put up trees, hang wreaths, string lights around our homes, and set up all sorts of holiday decorations. From the amateur decorators who keep it simple, to the seriously competitive decorators who strive for the best decorated house on the block each year, holiday decorating is a fun activity anyone can take part in. Unfortunately, as we all start decorating, one area tends to get missed on most homes. All too often, people forget to decorate their garages. An undecorated garage can look strange, especially when surrounded by decorations on other parts of a home. This year, include your garage in the magic of the holidays by trying one of these awesome holiday decorating ideas. Wrapping lights around the frame of your garage door can really make your garage stand out, without distracting from your other decorations. You can choose to incorporate the lights with the rest of your holiday decor, or simply use plain white or colored lights to add a bit of festivity. There are a variety of different lights available to suit your household’s needs. LED light strands tend to last longer and are more energy effective. If you life in a sunnier climate, solar powered lights are available for those looking to add an environmentally friendly touch. Over the top decorations are not always best, and even simple decorations can really make your garage pop this year. Start small by hanging a large wreath in the middle of your door. If you are going for the understated look this year, the wreath alone may be enough. If it needs a splash of something else, consider wrapping it in lights or hanging ornaments from it. A wreath will look good well past the New Year, so you can keep your home looking festive all winter long. If it looks too much Christmas like after the holidays, consider removing the lights and adding a simple bow or garland. If you are looking for a little decorating project for your garage door, consider making a Christmas tree out of lights. Using clips or hooks that can stick to your garage door, string out lights in the shape of a Christmas tree. Use any remaining lights left in the strand to zigzag across the tree outline, giving the appearance that the tree is decorated with lights. Then, hang ornaments from the lights, or from hooks hanging around the lights, and do not forget to stick a star or bow on top. This simple project typically takes less than an hour, and can really make your garage door stick out this year. Have you heard of garage door decor? Many companies sell full sized garage door murals that people can custom order and stick to their garage doors. Now you can turn your garage door into a scene from a winter wonderland, Santa’s workshop, or choose one of hundreds of other holiday designs. Unlike some of our other holiday decorating ideas, garage door decor murals are made to allow your garage door to continue being opened and closed. Once purchased, the mural can be hung in as little as ten minutes, making it an easy option for those not looking to invest tons of time into decorating. The murals are also built to last a few years, and start at around $150, so they are a very affordable way to get years of decorating done. If you have an artist in the family, consider letting them create a holiday scene on your garage door. Yes, painting the door would be permanent, so this idea is best saved for families who intend on replacing their door soon after the holidays. Consider painting more of a winter scene versus a Christmas one, so that the art will stay in style a little longer. This is a really fun idea that requires very little work to set up or clean up afterwards. During high traffic nights in your neighborhood, set up a projector in front of your garage door and project a fun holiday scene, or maybe a holiday movie. You will have to wait until after dark to start showing your projection, so maybe consider letting some neighbors know about it ahead of time so they can be sure to come check it out. Be sure to clean your garage door before hand so the picture quality looks nice. For some additional fun, set out chairs, pop popcorn, and have a family or neighborhood holiday movie night. Aside from the ideas we have already mentioned, there are limitless possibilities of what you can do with your garage for the holidays. 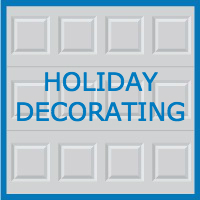 Look for vinyl garage door stickers to create fun holiday designs on your door, or magnets to spell out holiday greetings and phrases. A plus for spelling out holiday phrases is that you can reuse the letters all throughout the year. The next holiday that rolls around, add a little festivity to your home by spelling out another phrase or greeting. They are also fun to show a little sports team loyalty. With the wide variety of decorating options out there for your home and garage, decorating this year should be a breeze. Invite your whole family to take part in the decorating to get everybody in the holiday spirit. For other garage related tips and ideas, be sure to follow our Skywriters Garage Blog. We will keep you up to date on the latest garage trends, tips, DIY ideas, and more. Be sure to visit Blue Sky Builders online, in person, or over the phone at 630-852-8485 before starting your next garage related project. 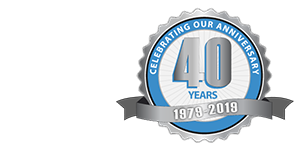 Our experts have years of garage related experience and are here to help with whatever your next project may be.